Even the shortest of perusals of history books will reveal that adherents of all the world’s great faiths and empires have seen the ebb and flow of civilisation: sometimes rising to the heights of enlightenment, and at other times plummeting to the depths of barbarity. Faith teaches both physical and spiritual ascension, yet human beings can be frail and forgetful. To focus on the lowest times of a civilisation while forgetting the heights it soared in centuries past, as Robinson insists on doing, is simply irrational and ahistorical. The Muslim world is clearly passing through a time of immense intellectual, social, cultural, political and religious pandemonium. This has not always been so, and God willing, it will not be so in the future. The current malaise neither defines Islam nor is intrinsic to the faith. There are a variety of reasons for the malaise, many of them political and outside the control of Muslim countries themselves. Some commentators will explain that Muslim countries are mere pawns in a chess game for political and material control being played by much bigger and richer world powers. Others will explain that the Muslim world reached immense heights in the past, but then allowed itself to stagnate and stupefy. Its record on human rights, women’s emancipation and political transparency was one of the best in history, but it now wins prizes for the worst. Whatever the criticism, it is still fair to say that the Islamic world has given the world some of its most glittering, tolerant and scientific civilisations. To deny this and claim that Islam has contributed nothing positive to the world is sheer ignorance. Robinson’s book divides history and our present existence into binary opposites. The premise, chapter, verse and conclusion of the book is that Islam is depraved, Christianity is noble. Muslims are uncouth, Christians are cultured. Islam destroys, Christianity builds. Muslims subjugate women, Christians elevate women. Islam ordains slavery, Christianity condemns slavery. Muslims are paedophiles, Christians are saints. And so on and on, ad nauseam. It is thus important to set the record straight. TR and his ilk need to realise that murderous genocide, racism, sexism and curtailment of basic human rights will certainly be found in the histories of all world civilisations. Christian rule has seen its fair share of psychopaths and tyrants, as has Islam. The torture of heretics, public lynchings of non-conformists, burning books and persecution of minorities can be found in the histories of all great empires. But there are also numerous examples of justice, emancipation, invention and tolerance. Just as it would be nonsensical to define Christianity by the Spanish Inquisition or the KKK, so it would be nonsensical to define Islam by Isis. Catholic priests who raped young boys and Muslim men who groomed and raped young white girls made a mockery of their religions and abused their positions of power. Such people have no faith, morality, decency or Godliness. Their respective religions cannot be defined or condemned because of their vileness. There is a danger today from extremists among Christians, Jews, Muslims, Buddhists, Hindus, Sikhs, the Far Right and others. Faith remains a powerful force in politics and popular culture; it can be utilised to offer peace, love and harmony, or it can be used to inflame, degrade and hate. 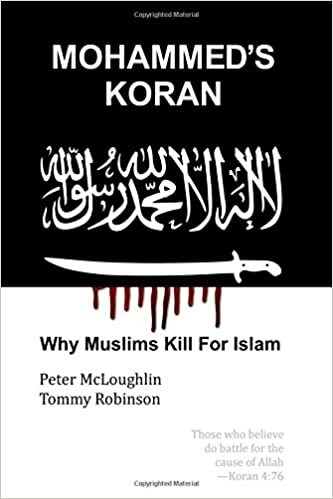 Robinson’s book is an affront to all faiths, to history and to truth itself.